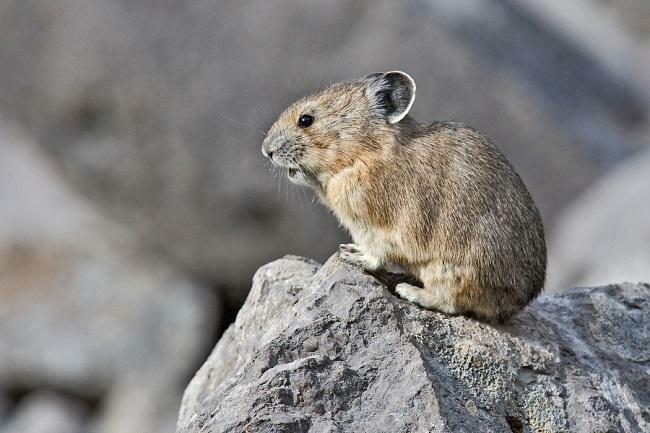 Remember how climate change was going to wipe out all the mountain Pikas? Never mind. The American pika (Ochotona princeps), a relative of rabbits, occupies rocky environments in the mountains of western Northern America. It has been widely thought that pikas could not survive extremes of temperature and thus were at risk of running out of space at the tops of mountains as temperatures rise due to climate change. But is there more to the story? Previously, when researchers visited pika habitat sites warmer or drier than usual in the Great Basin, where they had historically lived, they found that many of these sites no longer were occupied. It was thought that pikas had been forced to higher ground to escape the warming temperatures or had died, and it was concluded that pikas were in threat of extinction in the Great Basin due to climate change. However, these studies were focused on historic sites and did not examine the distribution of pikas at other marginal locations or in environments where they would more typically be expected to occur. A new study, “Distribution, climatic relationships, and status of American pikas in the Great Basin, USA”, published in Arctic, Antarctic, and Alpine Research, examined the largest set of records for occupied and extirpated (vacant) pika sites across a four-state region encompassing the entire Great Basin, and documented pikas inhabiting climates and territories never before reported. The study found that pikas occur in conditions wetter and colder, as well as warmer and drier, than described from the prior limited sites. Pikas were found at elevations spanning 7,800 feet in elevation, from 5,350 feet to above 13,000 feet, and traversing 40 mountain ranges across California, Oregon, Nevada and Utah. Millar and her colleagues gathered 2,387 records of occupied pika sites, 89 records of previously occupied sites that were later found vacant, and 774 records of sites that contain older signs of occupancy, but at which extirpation could not be confirmed. No consistent pattern could be detected in the elevations or climates of the confirmed and unconfirmed extirpated sites. Additionally, some areas of population loss were found close to other inhabited areas sharing similar climate. “Climate conditions do not adequately explain locations of the extirpated and ‘old-sign’ sites,” Millar said, “suggesting that other factors interact with climate and contribute to the loss of pika populations in some environments.” Recognizing that non-climatic factors influence pika declines is important information that enriches our understanding of conditions that allow this species to persist and those that may contribute to local declines. As long as there is enough vegetation for them to collect and build a hay pile to use during the winter, I would imagine they will adapt to any climate condition. If it’s getting warmer, that can only mean one thing: year ‘round hay piles!